Photograph courtesy Roger Geach 27030 manoeuvres 25079 around Eastfield depot on May 4th 1982. The nineteen year eleven month career of D5229/25079 was split between allocations to London Midland, Eastern & Scottish Region depots. April 1972 to Leeds Holbeck (55A). 25079 was the 190th Class 25 withdrawn, one of six retired during August 1983. After withdrawal 25079 was moved to Swindon Works on September 29th 1983 and scrapped by Christmas 1983. Noted Crewe Works April 1966. Noted Glasgow Works April 1977. Noted Derby Works August 1978. 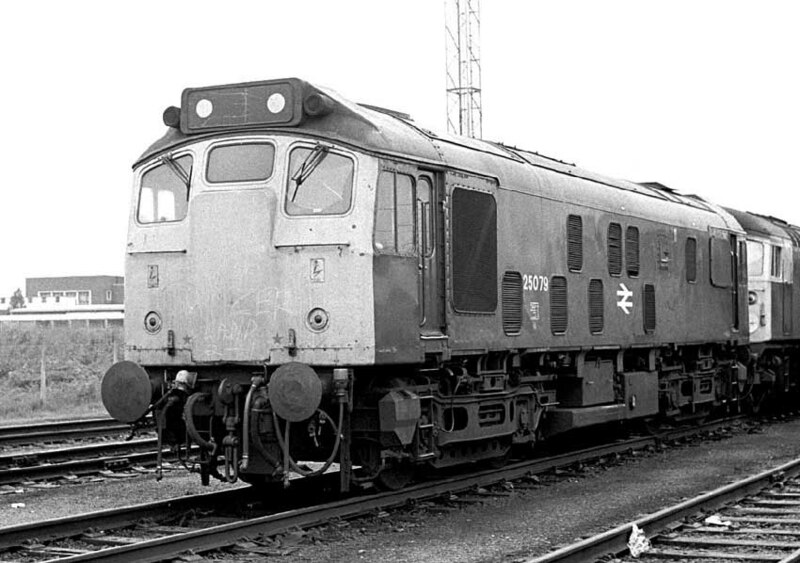 When Derby undertook redesign of the Class 25 bodywork, the batch of locomotives that would become D5223 - D5232 were transferred from Derby to Darlington. 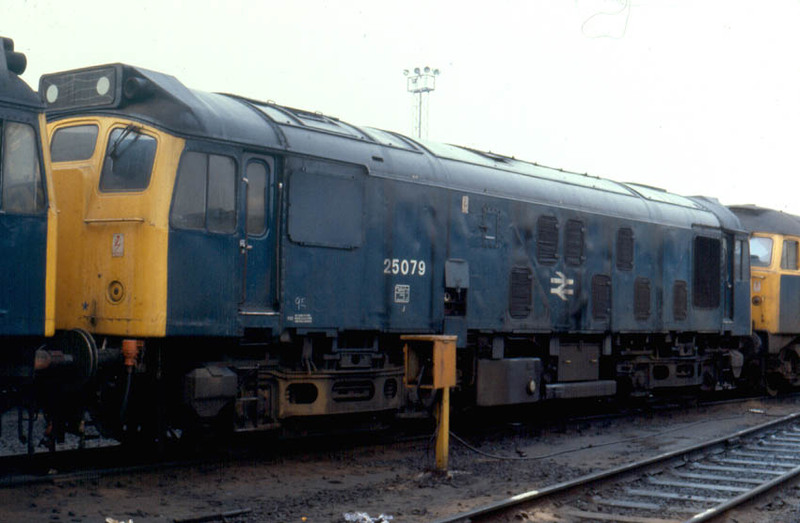 This allowed Derby to retool it's production line without causing major interruption to the Class 25 delivery schedule. These ten machines, including D5229 featured on this page were destined for service on the Midland lines north from St Pancras. The frame for D5229 was laid down during April, being completed and delivered in September to Cricklewood (14A). On February 13th D5229 worked a Morecambe - Leeds (2N73) passenger service. 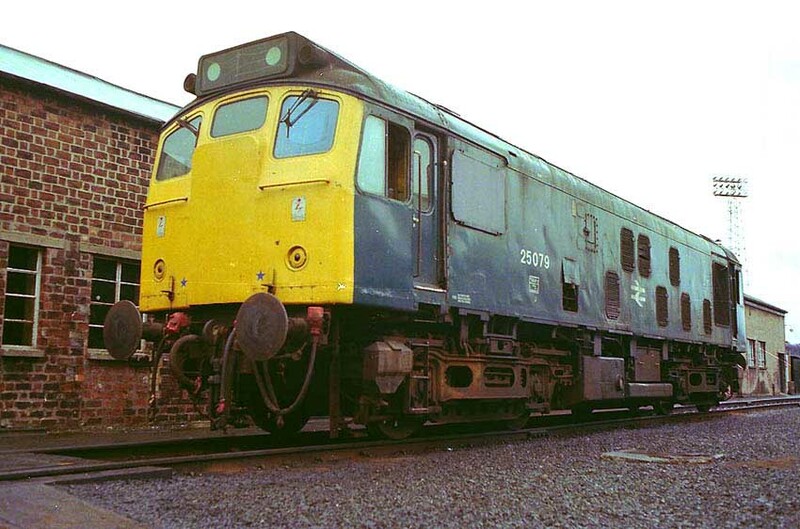 Although Derby, Darlington & Glasgow bore the brunt of the early Class 25 repairs, by the end of April Crewe Works had also started to accept Type 2’s for heavy repair, included in those received by the last week of April was D5229. On December 5th the 16.55 Sheffield - Bristol Temple Meads required the assistance of D5229 from ? to Worcester due to problems with Class 47 No. 1736, both were replaced at Worcester by 1926. Condition August & October: green livery, small yellow warning panels (August) with curved upper corners, blanking plates in place; by October the locomotive had received full yellow cab fronts. During February D5229 was transferred to the Nottingham Division (D16). Condition August: green livery (very work stained) with full yellow ends with frame level stripe on bodysides, gangway doors in place, no blanking plates, hand/footholds still present. A little off the beaten track on January 16th was 5229 working an evening Norwich - Cambridge service, deputising for the more normal diesel multiple unit. At this time some March crews were passed on driving the Class 25's allowing them to venture across much of East Anglia if more suitable power was not available! The 16.25 York - Newcastle parcels was noted with a variety of power throughout May including 5229 on 14th. 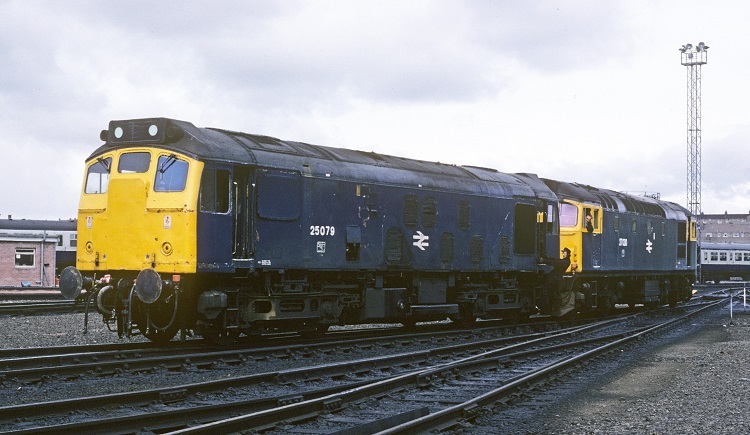 By December 1971 (most likely earlier) 5229 was in blue livery with full yellow ends. 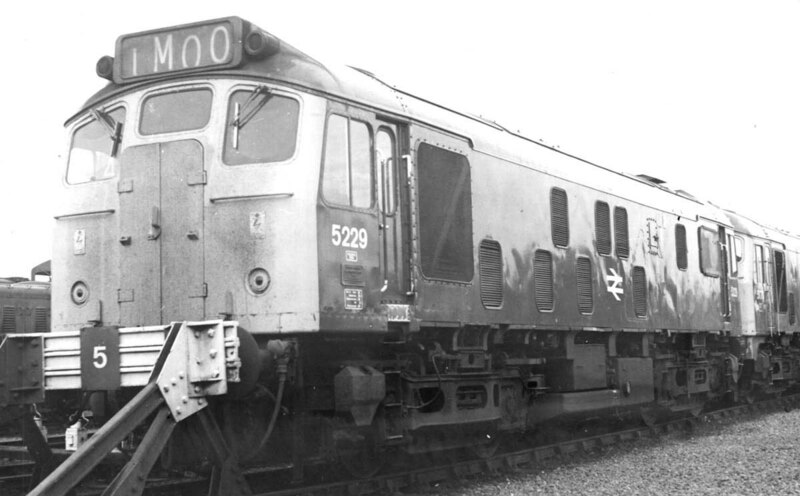 A major reshuffle of locomotives occurred to accomodate the gaps left by the withdrawal of the Western Region diesel hydraulic locomotives and the less than successful Scottish Region Claytons & North British products. After three years on the Nottingham Division and as part of the reorganisation 5229 moved to Leeds Holbeck (55A) in April and then on to Tinsley in October. Photograph collection of webmaster July 1st 1972 with 5229 at Holbeck, in blue livery, but still with the gangway doors intact. On July 7th 5229 made an unexpected trip to the seaside when it took over from a failed 394 at Sheffield on a Manchester - Skegness service, it is presumed that the Class 25 worked the return leg throughout? The 21.30 Leicester - Birmingham New Street on October 28th was worked by 5229. 25078/79 moved from Tinsley to Springs Branch during March. 25079 worked the 08.00 Llandudno - Huddersfield (or York?) on September 13th. A week later on September 20th 25079 & 25130 worked the Derby - Norwich - Yarmouth - Norwich - Walsall diagram, a total of 370 passenger miles. During May 25079 transferred to the Scottish Region and would spend almost five years at either Haymarket or Eastfield depots. Not long after transfer to Haymarket, on May 19th 25079 worked the 15.10 Aberdeen - Glasgow Queen Street. Almost an hour's delay was incurred on August 10th when 25079 failed at Gleneagles whilst working the 09.52 Dundee - Glasgow Queen Street. 37149 took the train forward. Two Scottish locomotives 25079 & 25083 worked a Derby - Norwich football special on September 18th. 25079 was noted at Glasgow Works during April. On August 10th 24112 came to the assistance of 40123 at Dalwhinnie working the 09.35 Glasgow/Edinburgh – Inverness service, whilst a little further south 25079 became a failure at Gleneagles on the 09.52 Dundee – Glasgow Queen St, rescued by 37149. On April 22nd 25239 & 25079 worked the return leg of a Nuneaton - Edinburgh day excursion, presumably as far as Carstairs. An Open Day at Coalville on August 20th featured a selection of locomotives including 25079 & 40076 brought over specially from Derby Works. The use of 25079 on March 2nd's 13.38 Dundee - Glasgow Queen Street was shortlived with 40070 taking over at Perth because the Class 25 could not heat the train. An adventurous weekend trip from Ealing Broadway to Aberdeen/Inverness March 16th – 18th proved a little too adventurous as it was curtailed at Aberdeen running over seven hours late, mostly caused by bad weather. The outward leg was taken over at Mossend by 27016 & 25079 to Aberdeen, the premature return from here featured 25026 & 25068. On August 24th the 08.44 Glasgow Queen Street - Dundee was worked by 25079. 25079 at Aberdeen on February 24th 1979. Photograph courtesy Martin Bray 25079 at Ayr on July 30th 1979. On May 6th the 21.40 Edinburgh - Carstairs was worked by 25079. The 14.44 Glasgow Queen Street - Dundee on July 1st was worked by 25079 & 27106. Double headed Type 2s featured frequently on the (Fridays) 17.25 Glasgow Central – Stranraer, followed by the next day's 01.20 Stranraer Harbour - Blackpool to Carlisle and returning with the 09.43 (SO) Blackpool – Stranraer Harbour, so noted were 25235 & 25079 on July 25/26th. The next day (27th) the same pair worked two motorail services between Stirling & Mossend Yard. On September 8th 25079 worked the 14.44 Glasgow Queen Street - Dundee. Towards the end of October for several days 25079 was acting as carriage pilot at Craigentinny and working between there and Edinburgh Waverley with empty stock. During February 25079 returned to Haymarket. Photograph courtesy Tony Sayer A fine study of 25079 at Polmadie on June 13th 1981. During July 25079 was active on a variety of Scottish passenger workings. It started on 6th (?) with the 01.05 Perth - Aberdeen, followed on the 15th & 16th with a Carlisle - Glasgow working. On 27th it was back to the early morning Perth - Aberdeen trip before closing out the month on the 30th's 05.55 Stirling - Edinburgh service. After July's busy workings August only produced 25079 on August 13th's 12.40 Glasgow Central - Carlisle and the 21st's 06.40 Glasgow Queen Street - Dundee. October and November brought more Scottish passenger workings for 25079, principally noted on the Edinburgh - Dundee route, with the third week of November being particularly hectic. 25079 escaped from the Scottish Region during the first week of December and was used on 7th & 8th to work the 07.45 Manchester Victoria - Bangor & 11.12 return. On December 28th 25079 was on the Edinburgh - Dundee circuit for most of the day, working three trips. After a year at Haymarket 25078/79 moved over to Eastfield during March. Considerable passenger mileage was run up by 25079 on March 8th, starting off with the early morning Mossend Yard - Glasgow Queen Street working off the 1S07 Euston - Inverness, two round trips then followed on the Queen Street - Dundee circuit. The next day was quiet for 25079, but on the 10th the day started with the 11.05 Perth - Edinburgh, three more similar trips ensued before ending with the 18.33 Arbroath - Dundee. The next day at least one roundtrip Edinburgh - Dundee service was worked. March 27th was likewise busy, covering at least six workings between Edinburgh, Perth, Dundee & Arbroath. For much of April 25079 continued criss crossing Scotland on passenger workings, highlights included 1st's 20.50 Carlisle - Perth, the 11th saw two roundtrip Lancaster - Carlisle trips, and the 12.40 Glasgow Central - Carlisle on 24th & 26th. Passenger activities decreased in May being noted only on 17th, 25th & 28th. Although 25079 was transferred to Longsight during September the summer passenger workings suggest it was already south of the border by early summer. It was off to the seaside on June 19th when 25079 & 25186 worked the 10.10 Euston - Aberystwyth forward from Birmingham New Street, returning with the 16.05 to Shrewsbury. The surplus of Type 4s and the recently arrived Class 31s on the Midland did not prevent the use of the Class 25s on some odd workings during August. On 11th 25079 rescued an ailing 45145 on an afternoon St Pancras - Nottingham passenger whilst on 17th the 12.35 Northfleet – Toton merry-go-round featured 25034 & 25079, other pairs also handled the Toton – Acton workings. On the early afternoon of April 8th 25079 & 37169 were noted passing Ditton No.2 signalbox with 6Z53 Garston - Mansfield. 25079 & 25158 were noted doubleheading a Northwich - Tunstead empty rake of ICI PHV hoppers on May 10th, 25079 was leading. Three days later (13th) 25079 passed through Stockport with a ballast machine and some oil tankers. On June 10th 25079 worked the 10.16 Barrow - Nottingham as far as Preston, here it was replaced by 25277! During week of July 4th - 8th (exact date uncertain) 25079 was stabled at Bletchley. By July 12th 25079 was noted near Syston North Junction with three loaded bogie ballast wagons. The last Sunday in July and the first Sunday in August found 25079 assisting the electric services between Bletchley & Rugby whilst engineering works caused the power to be turned off. On July 31st 25079 & 25276 (or 25176?) assisted one northbound service, whilst on August 7th three southbound services were assisted with 25201. This day is believed to be the last time 25079 hauled any passenger workings. 25079 was withdrawn on August 28th 1983. Page added December 17th 2004. Last update April 16th 2019.